Off Grid Bazaar is a project development platform that helps small farmers improve their yield by selecting an optimal mix of crops and agro-processing systems like water pumps, grinding mills, and dairy chilling. It also provides risk assessment to banks, enabling more effective financing of farming solutions. Our solution uses proprietary algorithms to predict water requirements and recommend appropriate solar water pumps, which also include pay-as-you-go smart meters equipped with sensors that measure field-level farming data. 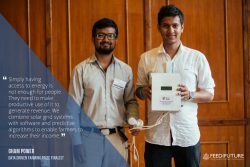 Off Grid Bazaar optimizes water requirement prediction algorithms by using actual yield-level data, further lowering the costs to farmers and maximizing revenue.